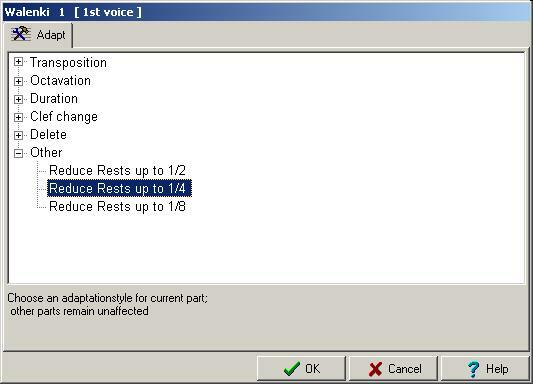 The part modification dialog allows you to perform automated part-wise modifications that would otherwise consume lots of time. When writing music for transposing instruments like trumpet, saxophone, alto recorders etc., it is often essential to alter transposition such way that the part for the transposing instrument is written at the right height, the right clef, and the right number of accidentals. The transpositions listed here will do for most purposes. If you want your piece of music one or two octaves up or down this is the place to look. Sometimes you find yourself having a piece of music that doesn't look nice in the used meter (lots of 1/32 notes for instance). By doubling or halving the meter (and the note durations accordingly) you can suit the notation to your needs. If you are rewriting music for another clef it it will often be necessary to change pitch as well in order to keep the notes within reach of the usual staff range. Once in a while you'd like to get rid of text, whitespace, hard bar lines or whatever. You can of course look for all the offending objects and delete then one by one on the working-area. However, a much more efficient way is to use one of the delete functions provided here. When you create an automatic bass-part and are going to modify that part, you might want to get rid of the abundance of rests. Rest reducing is the solution.